As any reputable snow removal professional knows, service is the name of the game when it comes to keeping your customers' properties safe during the winter. If you don't get snow and ice under control in a timely fashion, the potential for injuries and legal liability is very real. And even though the gold standard for de-icing sidewalks, parking lots, and walkways has always been salt, many ice control contractors have made the switch to liquids over the past couple of seasons. Salt brine de-icing may seem a little 'out there,' but once you dig deeper, it's easy to see why using liquid is better for business. Here are five benefits of liquid de-icing for you to consider. You know that accuracy is crucial when it comes to superior ice control. If you miss even a small patch of ice, that's enough for someone to slip and incur serious injury. It's even more of an issue when salt is visible because people will have a false sense of security and won't expect the slippery patch. With liquid brine, even distribution is much easier to achieve, which means the level of protection is much higher. One of the biggest complaints about using salt for ice control is that it doesn't stay where you initially applied it. Salt gets tracked into vehicles, into commercial properties, and into people's homes, and it sticks to plants, which affects their growth in the spring. With salt brine de-icing, the liquid stays where you put it, and any incidental mess or damage is eliminated. To say time is of the essence when it comes to ice control would be a massive understatement. Businesses can't just shut down every time there is a snowstorm or frigid temperatures, so it's important to have access to products that work quickly. Salt requires moisture to begin working and take effect, but liquid de-icers start working immediately. Being able to do a better job is one thing, but being able to do a better job while also saving money is a contractor’s dream. Salt brine de-icing only requires about 30% of the volume you’d need in salt to get the job done, so you can use far less while still getting the other benefits of using liquid. Pro tip: Equipment used for liquids lasts much longer than equipment used for solids. This will bring machinery costs down as well! If you have ever had to dump multiple bags of salt into the salter to get started, you know how taxing it can be physically, not to mention time-consuming. When you use ice master systems and liquid brine, all you have to do is fill the tank and mix, and you're good to go. In every industry, some advances are made that enable the experts to do their jobs faster, easier, and more reliably. Sometimes, what seems unusual at first becomes the normal way of doing things down the road. Salt brine de-icing is the next wave of ice control for the top snow and ice removal contractors in the industry. 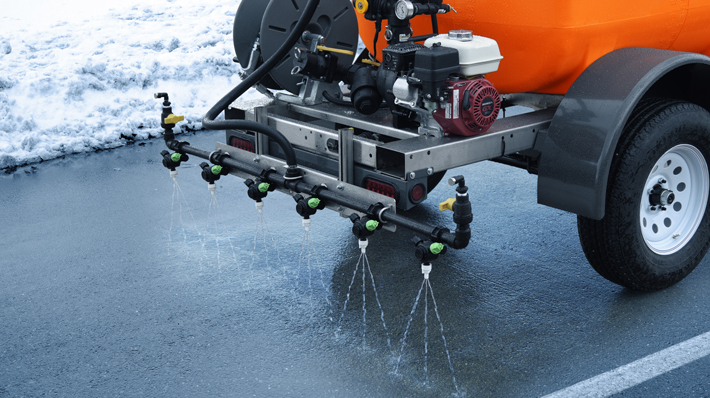 If you’d like more information on how liquid de-icing and ice master systems can help you take your ice control game to the next level, get in touch with us at Ice Master Systems today.